Do you want to impress your friends by showing that you have earned so & so dollars from Google Adsense ? Showing them Google Adsense screenshot is a tricky way to make them believe you. 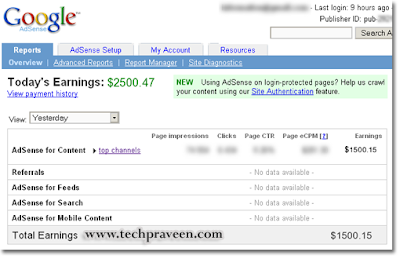 So try Google Adsense Generator,you can now create your own proof that you are a true AdSense-millionar. All you need to do is just enter your amount in dollar and press the Make Money button. I think its old news now.. Isnt it?